These figures are some of my favorites of the Copplestone ones I have seen in the flesh. I doubt I would be able to resist the temptation of converting that horn blower to rasta-gobin. As I had mentioned to you previously it’s the wolf that does most of the fighting in my mind. The rider on the back is just there to protect its spine from arrows and possibly as a scoobie snack when rations are running low. 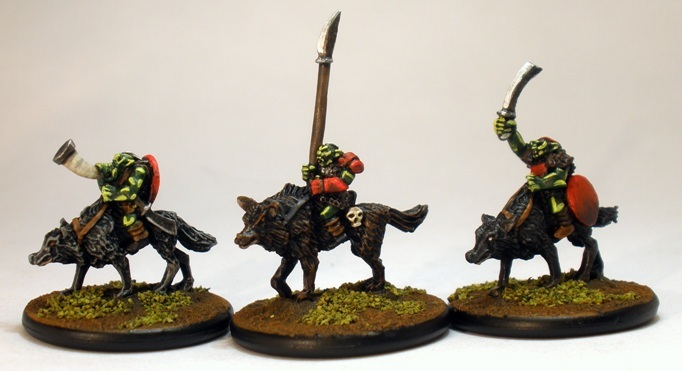 The Warhammer Fantasy Battle school has always suggested to me that the unit is “Giant Wolves with Goblin Mascot” rather than any notion of the goblins being in charge. The warg jockeys in the LotR movies all tend to have severe scarring and/or limb loss consistent with maulings from large carnivorous mammals. Coincidence? I think not. I find it hard to think of a Copplestone figure that I actually dislike. One of my favourite miniature sculptors for sure. Yeah, that Mark knows his stuff – as do you! I never would’ve dared using contrasts so stark as those you’ve used on the trumpeter. Looks good! Thanks Mattias. I tend to layer rather than blend and with some colours I do tend to push the contrast a bit. From my perspective its a diminishing returns thing: I try to avoid painting subtle effects that wont be seen on the tabletop as I wont get any projects finished if I do. In turn that sometimes leads to those sort of cartoony, cel-shaded looking highlight choices seen above. I never had a problem with the cell shaded look for wargaming minis. I feel it is more apt for the purpose. If one is painting for display then blend away but as you say the subtle effects just don’t get noticed on the tabletop. Yeah, but like you and your recent Freebooter Kaptin, its not really a hard and fast thing. Sometimes I just enjoy painting a certain miniature or part of a miniature, or using a specific colour or colours and those areas get more detailed treatment just because I am enjoying myself more. The main thing is that I try to avoid getting bogged down on a figure, in an effort to avoid the dreaded slump. With that in mind I will happily take a faster route in order to get a troublesome figure finished. I agree duncanmcfarlane. Conceptually I have zero issue with the blurred lines between the two species, if the goblins and orcs indeed even are two distinct species. In game terms I do like to be able to make the distinction between two types of cavalry though, heavy and light. Often in this context that is conveyed by orcs on boars and goblins on wolves, so when that distinctions blur, I just need to make sure that I find a visual distinction that will work well to define them clearly as gaming pieces. Gaming with them is the goal in the end. Fair point. I tend to think wolf mounted cavalry should either get a bonus against horse mounted cavalry or else give the horse mounted ones a penalty. Historically horses were panicked by elephants and gunfire. It was possible to get them used to them to some extent, but i doubt it’d make horses panic any less if an elephant attacked them or their riders. And i’d have thought it would be pretty much impossible to get them used to fighting giant wolves (if those existed).